Even though nose-kicking limburger got its start in the Belgium town of Limburg, we consider it a German cheese. Bavarians have been making it in great quantities since the 1800s and German immigrants brought this flavorful cheese to Wisconsin. These days, Wisconsin claims limburger as our own -- literally, since we are the only state in America still producing it thanks to our pals at Chalet Cheese Cooperative in Monroe. We recommend you get to know limburger, but definitely store it in very tightly-lidded glass containers. Contain the (wonderful) stink! Limburger is seriously stinky, so take special care in handling it and all other surface-ripened cheeses, for that matter. Cheesemakers apply a culture of yeast and bacteria, called a "smear," to the surface of limburger that transfers easily, so sanitize your cutting equipment before using it for other cheeses. Limburger rind tends to be bitter, but if you trim it you greatly reduce the intensity of its aroma and flavor. Rind on, if you are so inclined -- entirely up to you! 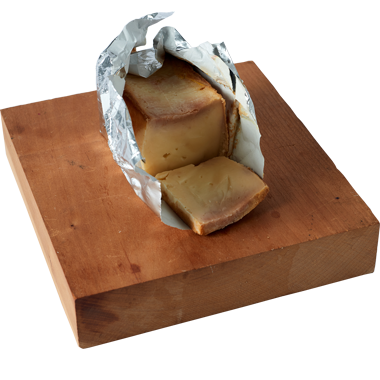 Limburger is a classic cheese that gravitates toward dressed-in-tweed drinks. We like to eat it with a full pint in hand -- bock, stout, pale ale, porter, brown ale, lager or a Belgian ale. If wine sounds better, then go with personality -- cabernet sauvignon, merlot, red zinfandel, beaujolais or grüner veltliner. The best way to enjoy this cheese is the traditional way -- sandwiched between dark rye with thickly sliced raw onion and pub mustard, with a frosty mug of bock beer close at hand. We also love a crisp crust, ooey gooey limburger pizza, topped with sweet and slow cooked caramelized onions. For the record, limburger never met a plate of boiled, buttery potatoes it didn’t like.